Visit Koa Coffee online at KoaCoffee.com for the very best coffee. Koa Coffee is made on a Hawaiian plantation where the high elevation, sun drenched mornings, and abundant rain fall enables the beans to mature more slowly--allowing for a larger size and superb grade. So bring the best of Hawaiian coffee into your home with Koa Coffee, but be sure to stop by 58Coupons.com first to save with the latest KoaCoffee.com coupons, KoaCoffee.com discounts, KoaCoffee.com deals and KoaCoffee.com promo codes! Buy a 4-pack of Kona Coffee from Koa Coffee and you'll save 33% off regular retail. Click link to get started. Shop Koa Coffee today and receive free shipping on all orders over $99 or more. Click link to start shopping. 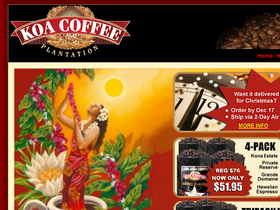 Act now and save $15 on the Kona coffee triple pack at KoaCoffee.com. Click link to save. When you spend $99 or more at KoaCoffee.com, receive a free pound of Koa Gold Hawaiian coffee with promo code. Click link to get started. Sign up for the Kona Coffee Club today and receive up to 10% off. Also, receive a free mug and half a pound of coffee with coupon code. Click link to sign up.